If you only get to see just one astronomical event this year, don’t miss the opportunity to behold the appearance the Mahealani supermoon on the night of November 14, 2016. This rare phenomenon promises to offer one of the most spectacular celestial experiences of a lifetime. 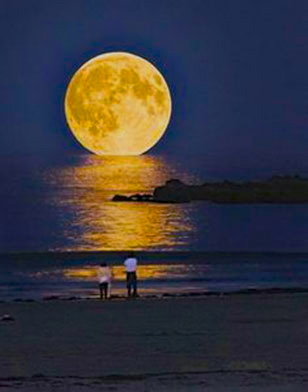 On this night, the full moon will be the closest to the earth in 70 years, 14 per cent larger and 30 per cent brighter. Celebrated in mele (songs) and hula dances, the radiant glow of the Māhealani moon is spiritually associated with the legendary beauty and divine essence of the Hawaiian goddess, Hina. In ancient Hawai`i, Māhealani was the moonlit night when kahuna (priests) performed ceremonial lunar rituals and conducted traditional rites of passage. Kahuna hāhā (diagnosticians) favored Māhealani for conducting health screenings and discovering the cures for disease. According to kahuna teachings, on the night of Māhealani: E ‘imi aku ‘oe a e loa‘a mai (Seek and you shall find).